Toronto property division lawyer. On the surface, property division is fairly simple. In principle, after separation, the financial net worth of each spouse is calculated and the net family property is equalized or split down the middle. The spouse with more assets in his or her name pays the spouse with fewer assets half of the difference between their assets. Both partners leave the marriage as equal partners in terms of property. There are also a wide range of exceptions to the “split down the middle” approach, particularly if the relationship has been short. Inheritances and gifts received during the marriage are exempt from sharing and property owned before the marriage can all be exceptions to the law and may complicate matters considerably. Hiding or failing to disclose assets can also cause severe complications and result in court costs being awarded to your spouse. At Baker & Baker, we have the necessary background to help with complicated property matters. Particularly when it comes to business valuations and complex investments and pensions, our Toronto property division lawyer can help you through the confusing process of separating your assets. We can help you come to reasoned, fair evaluations, so that both sides can emerge with their rights and property protected in the final divorce settlement. If there are complex issues, such as a jointly owned business, we can help you extricate your business affairs from one another. We can also help you work out how to both maintain your ties to businesses or property if it is necessary. In either case, mediation may be invaluable in helping you come to creative solutions rather than having a court impose a solution on you. Looking for a Toronto property division lawyer? Baker & Baker can help make your division of property understandable and fair. 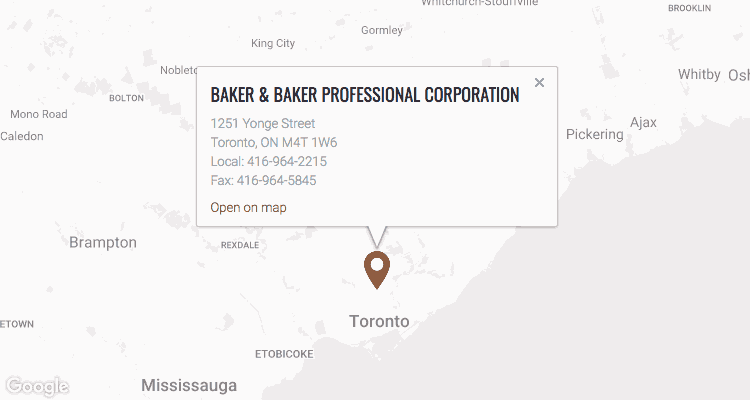 Contact Baker & Baker at 416-964-2215 or by email to set up a free initial consultation.